Most game companies are out to make money (we should really say "all game companies", but there may be one or two start-ups simply in it for the love of the craft and not to make money). There's no doubt that corporations have to think about their bottom lines, and the easiest way to rack up money is through franchises. An established series with expected goals, objectives, and play-styles is more likely to be successful than a new intellectual property. This is, sadly, a given. What often happens, though, is that the company will simply start churning out the same title over and over again with minimal changes. Many series have done this, not just Castlevania, with the likes of Sonic, Madden, Call of Duty, and many more all taking a place on the list. Most famously, though, was the Mega Man series. 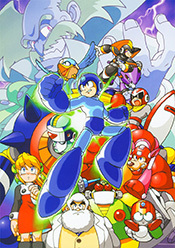 Through ten official titles (and a new one on the way), two spin-off main-series titles, and a series of Game Boy and Game Gear semi-sequels, the original Mega Man featured the titular blue robot fighting through level after level, defeating bosses (and collecting their weapons), all to go up against the evil Dr. Wily (who never died and never knew when to quit). Although the series started out fresh and interesting (with the "steal a weapon" mechanic being the signature of the series), as the titles marched on the series became less interesting, more of a slog through the "same-old" than broaching new ideas. Of course, part of that is simply due to the frequency of releases: through the NES era alone, Mega Man had six main-series entries (plus four Game Boy entires that reused elements of the main games), all released at a relative rate of one a year. To put that staggering number into perpsective, there aren't a lot of titles outside of sports franchises that managed to put out games at that rate. Mario only saw three NES entries during that span (and two proper Game Boy entries). Zelda only had two. But the blue bomber (the nick-name for Mega Man) saw a total of 11 titles during that span. The problem, and the cause of the "Syndrome", is that you can only improve a game so much within a year, especially when you have to come up with new levels, new bosses, new enemies, new power-ups, etc. The games just did not change much from one entry to the next, making the series feel like it was treading water instead of pushing forward. Of course, the "Mega Man Syndrome" was cemented through all the various spin-off series, each of which eventually fell into the same yearly-release formula. Mega Man: The original series, the originator of the "Syndrome". It featured six NES titles, two SNES titles (including the spin-off Mega Man & Bass), five Game Boy titles (only one of which actually featured a completely new storyline), and numerous other additional media. Mega Man X: Mega Man's first successor, X featured the same "steal a weapon" game play as the original series, but also allowed your hero to collect new equipment and gear to aid in his battles. The series had eight original titles (three of which came out after the series supposedly ended), two Game Boy reimaginings, and an RPG spin-off. Mega Man Zero: Mega Man X side character, Zero, takes the lead in this series that takes place 100 years after the events in the X series. Although ditching the "steal a weapon" game play, Zero can gain powers based upon how well he clears an area of the game. Four entries were released for this series, although the "Syndrome" was already starting to set in (as per various reviewers), with the second game. Mega Man ZX: Set 200 years after the Zero series, the game features human characters gaining the ability to merge with (and function as) classic robots from the series. Only two entries were released, although they played a lot like the Zero games. Mega Man Legends: Set centuries after the main series, the Legends series deals with Rock (Mega Man) Volnutt, a relic hunter who travels the world searching for refractor shards. It was the first series to feature full, 3D game-play. The game only had two main entires (and a prequel), and then was cancelled. Of all the Mega Man games, this series best dodged the syndrome. Mega Man Battle Network: Reimagining the original series for the Internet, instead of robots all the classic characters are "Net-Navi", computer programs that inhabit the 'tubes. A RPG at its core, the player was tasked with collecting "Battle Chips" to upgrade their navi, MegaMan.EXE. The series saw six main entires and two spin-offs, but four of the main series games actually came out in two different cartridges (not unlike the Pokemon series), bringing the total number of releases to twelve. Reportedly, the "Syndrome" was already in full effect by game three. Mega Man Star Force: Set 200 years after the Battle Network games, humans are now able to merge with the 'net-navis, now called EM-wave beings, and can explore the EM-net and the real world together. Game play is almost unchanged from the battle Network series, and the series saw three games (each with two releases), for a total of six entries. The "Mega Man Syndrome" is unrelated to another Capcom trend, "Capcom Can't Count".